The Beaconsfield goldfield is 41 km north of Launceston, and about 3 km west of the Tamar estuary. In early July 1877 William Dally discovered a rich quartz reef at Brandy Creek (renamed Beaconsfield 1879). Named the Tasmania reef, it was essentially the only large auriferous reef in the field, and was in almost continuous production until 1914. It produced a total of 854,600 oz of gold (approximately 30 percent of the state's gold production) from the treatment of 1,067,556 tons of ore for an average recovery of 16 dwt/ton. The gold was valued at £3,612,680 and the dividends paid amounted to £772,670. Alluvial gold attracted interest, but the field quickly became a quartz one with company workings the main activity. In October 1877 the Dallys sold their claim on the Tasmania reef to WD Grubb and W Hart, retaining a share in any company formed. On 26 October 1877 the Tasmania Gold Mining and Quartz Crushing Company (hereafter the Tasmania) came into being. It rapidly became the most important mine on the reef and was Tasmania's most productive gold mine, with a total output over three times greater than its nearest rival, the New Golden Gate Mine at Mathinna. The Australian Mining Standard (1898) rated it among the greatest mines in the nation on the basis of its output. 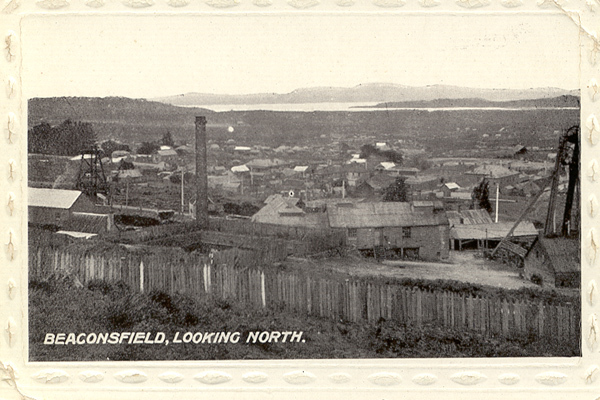 The census of 1881 revealed that with a population of 1,520, Beaconsfield was the largest mining district in Tasmania. Water proved a major problem for companies mining the reef. By the end of 1884 the Tasmania was affected, and amalgamation was seen as the best way of allowing the reef to be mined below the 400 ft level. The Tasmania had already bought the Golden Gate, and early in 1888 purchased the Florence, Lefroy, and Dally's United companies. Arrangements were made for a powerful pumping plant to meet requirements to a depth of 1,000 ft, and work was begun on a new shaft. Floodgates were built in the new main shaft, and outside the mine developmental work was undertaken with the aim of lessening the amount of water likely to find its way into the mine. Mining virtually stopped at this time. On 12 March 1892 the machinery started work, with the pumps capable of raising 136,800 gallons of water per hour. On 7 December 1894 the Phoenix Gold Mining Company was absorbed into a reinvigorated company. Huge alterations were undertaken at the crushing plant, and work began on a new main shaft. The solution was temporary only. As the Government Geologist wrote in 1903, 'The history of the mine is that in the course of driving on the reef intermittent bursts of water occur, followed by easing off after draining away the influx'. This occurred at the 600 ft level, at the 718 ft level, and again at the 1000 ft level in August 1902. Each influx meant that work ceased for a time. In early 1903 it was clear that work could not continue without a large expenditure as the mine was 'exhausted' above the 818 ft level and the water level was only 64 ft below this. An English offer to buy the mine was accepted and the Tasmania Gold Mining Company Ltd was incorporated on 2 October 1903. The total capacity of the pumping plant the new company installed was 6,500,00 gallons per 24 hrs working at normal speed, more than double the capacity of the old plant. Major and expensive developmental work was also undertaken. Surface work included the building of engine houses at Grubb and Hart shafts and a central boiler house. Substantial remains of these can still be seen. Cost overruns had to be met out of working profit and in 1906 one of the worst floods ever experienced in the area meant more expense. In 1909 the ore was giving a return of 34/- per ton while the cost of gaining the gold was 35/-. The company raised further capital but continued to run at a loss. The mine closed in 1914 due to a combination of factors including the refractory nature of the ore and labour problems, but mainly to excessive water intake (about 17,278,000 gallons per week) and the costs of dealing with this. Mining of the reef recommenced with first ore production occurring in 1998. First bullion was shipped 1999. As at 30 June 2004, approximately 480,000 oz of gold had been produced and ore reserves stood at 640,000 tonnes at 17.9 grams per tonne, containing 369,000 oz of gold. The mine closed unexpectedly after a rockfall on Anzac Day 2006 in which Larry Knight was killed. The rest of the shift fled to safety except for Brant Webb and Todd Russell, who were trapped almost a kilometre below the surface. Rescue efforts were prolonged by fear of causing further rockfalls and involved bringing in mining and disaster experts from other parts of Australia. Channel Seven's Sunrise program attracted more than one million viewers at 5.59 am on 9 May when the two men walked unaided out of the mine shaft after a fortnight entombed below. An independent special investigator was appointed to conduct an inquiry into the cause of the rockfall, the adequacy of safety procedure, and the steps that should be taken to make the mine safe. The federal government announced an $8 million dollar contribution to a community fund and $1 million for the establishment of a Larry Knight memorial engineering scholarship through the University of Tasmania. Almost $5 of the $8 million dollar grant has been allocated to the mining company. Matthew, Gill, Mine Manager, said this would ensure the financial security of miners by allowing maintenance work to proceed as they wait the outcome of investigations. Part of the money is to be used for further underground exploratory work if the mine is deemed safe to re-open. Otherwise it will be returned to the fund. At the time 78 miners were still employed with 52 having accepted redundancy offers. Meanwhile in July, Allstate Explorations, Beaconsfield Mine Joint Venture's senior partner, advised that it was looking for either an offer to buy shares in the company or a bid to purchase Allstate's assets outright. Beaconsfield Gold NL has since won legal recognition of its right to have the first opportunity to buy Allstate out of its share of the joint venture before Allstate can seek rival bids. The mine's reopening waits on the results of the inquiry and a coroner's request. In September the Beaconsfield Mine Joint Venture announced that Coffey Mining's team of specialist mining consultants had conducted a review and concluded that there was no geotechnical reason preventing the recommencement of operations. Further Reading: Australian Mining Standard, 'The Tasmania Mine' in Tasmania And Its Mineral Wealt,, Melbourne and Sydney, 1889; TD Hughes, 'The Beaconsfield and Lefroy Goldfields', in Australian Institute of Mining and Metallurgy, Geology of Australian Ore Deposits: a Symposium arranged by a Committee of the Australasian Institute of Mining and Metallurgy Inc. and edited by A. B. Edwards, Volume 1, published at The Office of the Fifth Empire Mining and Metallurgical Congress Australia and New Zealand, and of the Australasian Institute of Mining and Metallurgy, Melbourne, 1953, pp 1233–36; J Kerrison, ' Beaconsfield and Its Mine', Honours thesis, UT, 1962; Beaconsfield Gold, Grubb Shaft Gold and Heritage Museum, 5th edition, 1997; Mines Department Records, Register of Statistics from Various Mines, AB 955/1, p 203, AOT; AJ Noldart and VM Threader, 'Gold Deposits of Tasmania' in Australasian Institute of Mining and Metallurgy, Geology of Australian Ore Deposits, Office of the Congress and of the Australasian Institute of Mining and Metallurgy, 2nd edition, Melbourne, 1965, pp 518–21; WH Twelvetrees, Report on the present position of the Tasmanian Mine, Beaconsfield, Tasmania. Government Geologist's Office, Hobart, 1903; T Webster, ' An Archaeological Survey of the Hart's Shaft Plunger Pump Units Beaconsfield Gold Mine', Report to Beaconsfield Gold Mine Joint Venture, 1998; Weekend Australian 9-10 September 2006; Weekend Australian Magazine 8-9 July 2006; Examiner 22, 28 July, 5 September 2006.